The Two Sides of Ana: Episode 69 | TeleNovela Channel - Bringing you closer to lifes drama. Ignacio tells Humberto that the court ruled in favor of Ana. 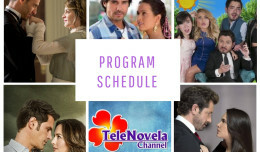 Irene calls Graciela to tell her that Claudia is giving birth at the moment while Graciela tells her that Claudia found out that she used her to testify against Ana. Meanwhile, the nurse informs Graciela that Claudia arrived at the hospital in a cab. At Claudia’s wake, Graciela blames Irene for her sister’s death in front of Rafael.